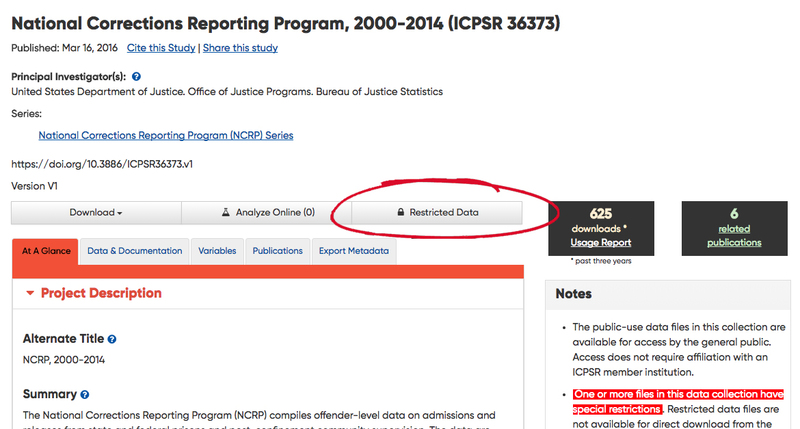 After determining a study's data are restricted, prospective data users must utilize the ICPSR online Data Access Request System (IDARS) to apply for access. Applicants must complete a new Restricted Data Use Agreement (RDUA) application, which must be initiated from the study's homepage. Investigators should create only one RDUA for all studies being requested for the proposed research project. Investigators must create a MyData account and password if one does not already exist. Click on the desired study on the search results page. On the IDARS welcome page, start a new application. Once inside IDARS, applicants must fully complete and submit the RDUA form for review by the NACJD Archive Director. Incomplete or incorrect RDUA forms cannot be processed and will be returned to the applicant for revisions. Note: In IDARS users can enter and save information in each section of the RDUA application. This allows users to open and exit the application as needed before final submission.